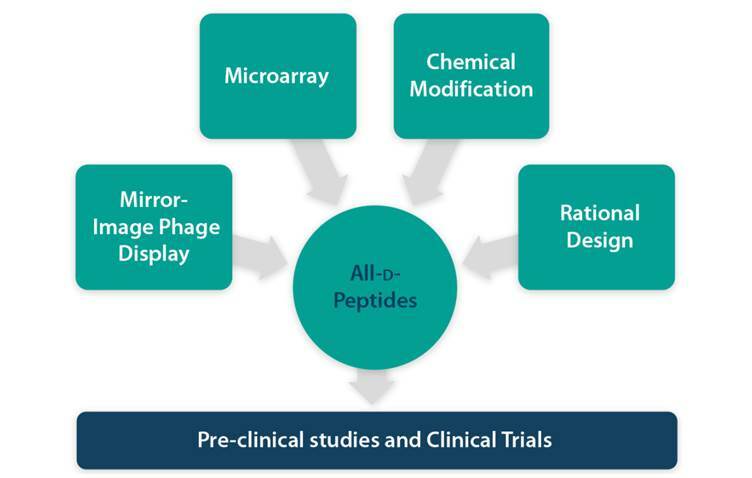 Priavoid uses mirror-image-phage-display-selection and various optimization technologies to develop compounds composed exclusively of D-enantiomeric (mirror image) amino acids. Our all-D-peptide development platform enables the generation of lead compounds for any given target, especially for CNS disorders. In contrast to natural peptides consisting of L-amino acids, this new class of drug substances is resistant to proteases, permeate the blood-brain-barrier effectively, display very low immunogenicity and degradation profiles in vivo and are therefore suitable for oral drug administration, for example as a tablet. Pre-clinical and clinical trials are pursued at Priavoid to further the development of drugs for treatment of neurodegenerative diseases. The drug pipeline of Priavoid is composed of 7 development programs for 6 CNS diseases.